Diggers Valley: 19 May 2018. The week beginning the 19th of May 2018. If you didn't bring a recipe, get out of the house! The four roosters are now almost big enough to eat. 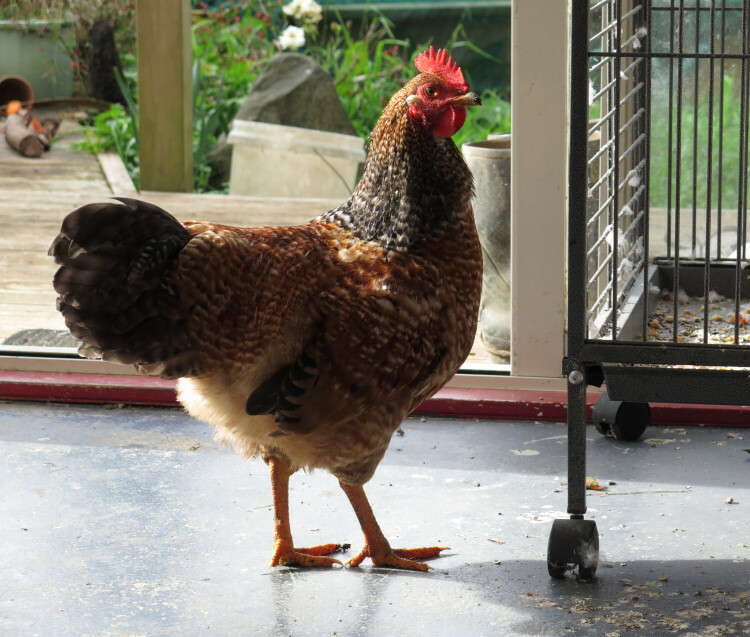 They are fine-looking birds. Our beloved William died this morning, just after his friend and running-mate, Dr John Bradley, took this gorgeous photo. His sudden death was obviously entirely unexpected, incomprehensible to us all. Stephan, cousin Christina and I were with a gathering of about fifty learners of te reo, having a one-day session at Te W&amacr;nanga o Aotearoa in town. I remember hearing a siren, which would have been the ambulance on its way out to Ahipara. My mobile phone, which barely anybody ever rings because we have no coverage at home, was in the ute when Elizabeth was trying to contact us. Stephan's sister Rachel eventually tried Christina and so we heard the news and went immediately to Elizabeth, where William lay on his bed, as if quietly sleeping, looking as though he would awake with a grin at any moment. We spent the rest of the day with William, with Elizabeth and then with family who arrived as soon as they could from points south. In a convoy of cars we drove William's coffin from town to Kaitaia College early this afternoon, where he was met by a gathering of all the students (and presumably staff, I was a bit too overwhelmed to notice) and a tremendous haka in recognition of his mana at the school. There's a short video of the car leaving the College here. From there we went to Roma Marae at Ahipara. It was a great honour to have William lie there for the days before his funeral. 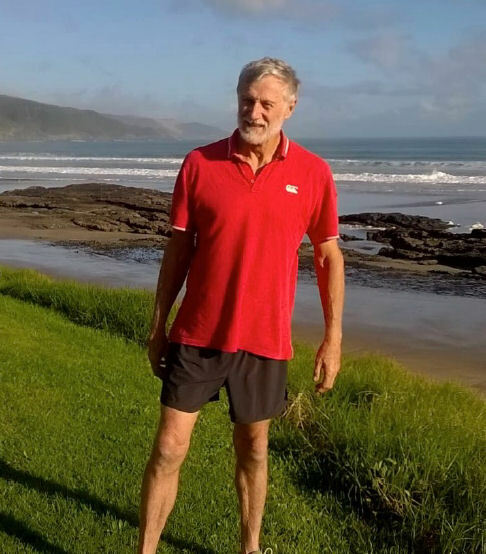 William had close and deeply respectful ties with many people of that Marae, some of whom were also staff at the College and in some cases, also former schoolmates. There were a lot of fine stories told. 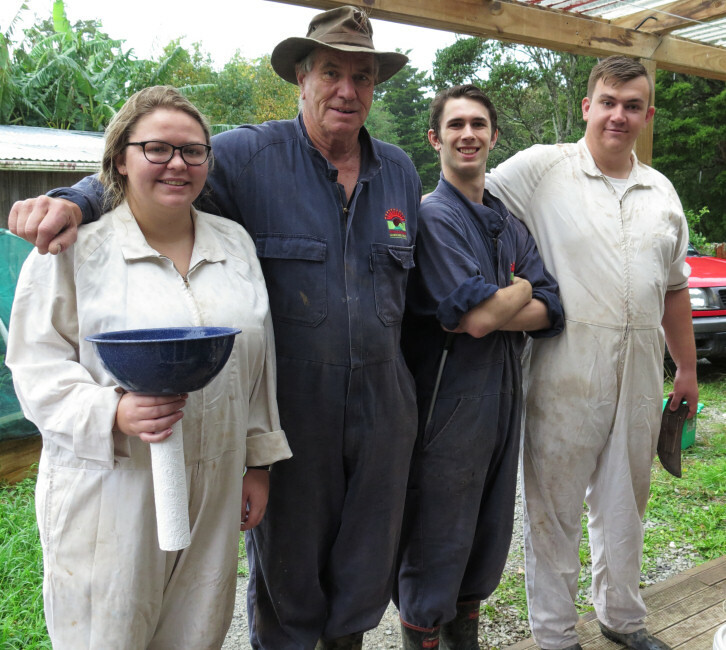 We spent as much time as we could at the marae with the rest of the family but farming goes on, whatever else is happening. These four have been booked to go to the works for a couple of weeks and today was their day. We brought them in to the yards early this morning, I sprayed a bit of pink paint on their tails as they walked around the yards and off they went. Zeb (Zella's son of 2015), on the right, has been a pleasure, as has his mate 783. 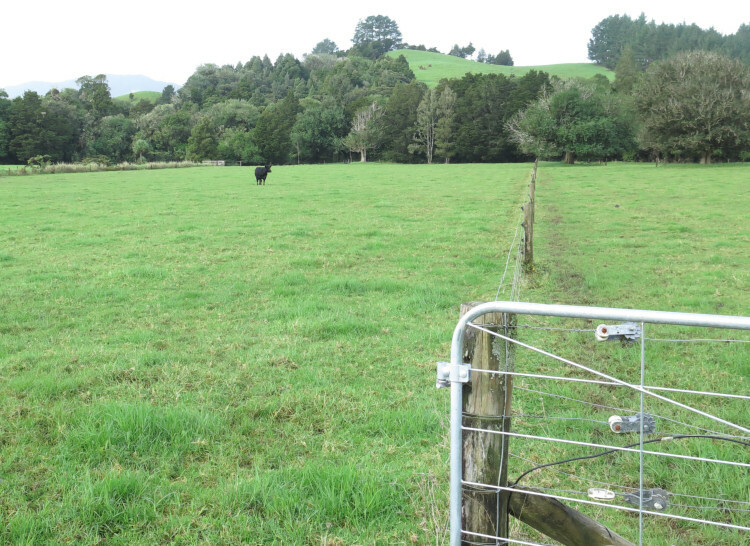 The two of them would ordinarily have gone off to Heidi with the others as weaners, except that an acquaintance of a friend had asked to buy two quiet steers and then reneged on the deal, after the others had already been sold, so they stayed here. 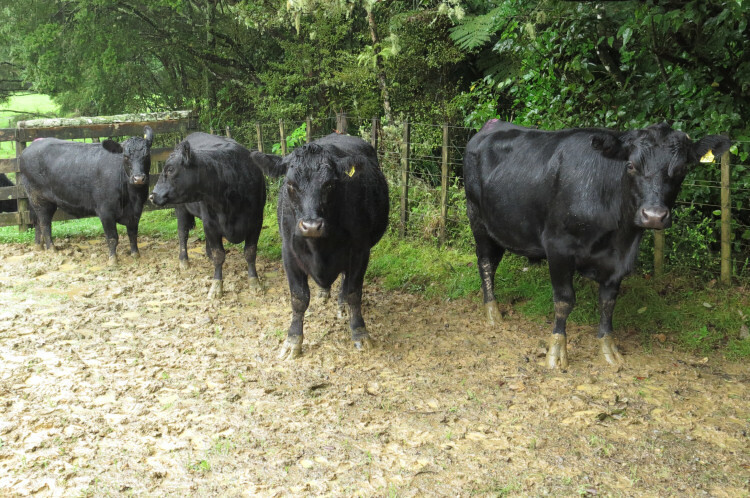 The heifers are 781, crazy daughter of Gem 698 and 152, Demelza's daughter at the far left. Stephan and his helpers of the day put them quietly on the right-on-time truck while I went and did other things. Here are the helpers: Shayna, Liam and Dylan, the latter being two of Stephan's great-nephews. They are great, too. They came partly for some time away and also, as Dylan said, because they wanted us to continue to be included, despite our need to come home to do things. They're all such lovely people. 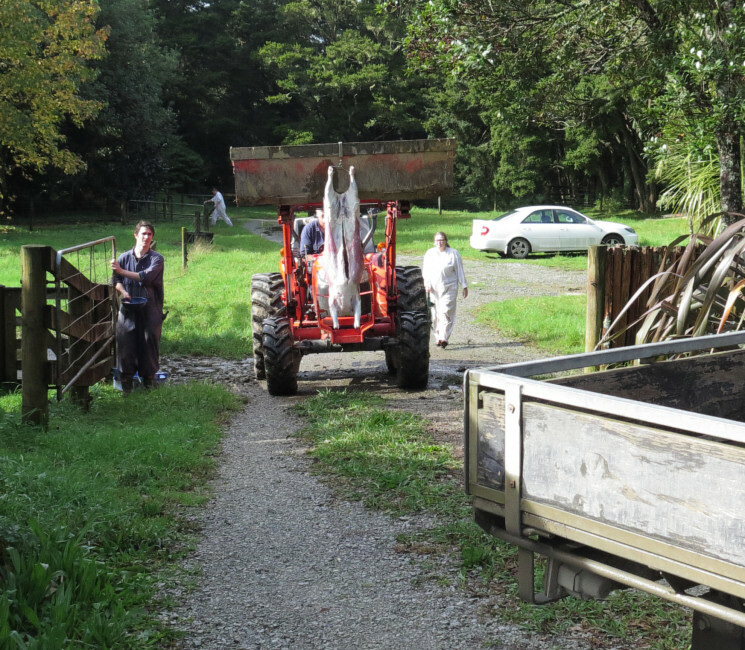 There was another important task this morning: the killing of the wether hogget, as a contribution to the marae, where hundreds of people came to pay their respects to William over the three days and were all being fed. The young people helped and supported Stephan as he did the deed. We spent much of the day at the marae. Neighbours Sandi and Gary very kindly brought the house-cow calves in for us in the evening, so we could also stay there overnight. The last night before the funeral involved a lot of story-telling by everyone close to William. We snuck out in the dark this morning, to return home in time to milk Zella as usual and then returned in our ironed, clean clothes for the closing of the coffin and the departure to the funeral service in the College Hall. That was recorded for anyone who couldn't be there. I have yet to watch it through (there is no sound at the start and some problems with the microphone when the sound does begin but apparently it's audible when necessary if one listens carefully). Most of son Mathew's eulogy appeared in The Northland Age the following week. After the funeral Stephan and I drove William away, through a throng of students and teachers and another electrifying haka, then waited outside his mother's house in town for an hour or so, not sure whether any of the family wanted to accompany us to the crematorium or not. Just before it was time to leave, Mathew and Samuel joined us and off we went, with them following. The Kerikeri Crematorium is a building sufficient to its only purpose. Funeral services are not generally held there, as the public front of the building is simply a receiving door, opening to a small curtained space from which a coffin is then removed by the staff within, after the outer door is closed. As there were only four of us, we drove around to the back where a trolley could be wheeled to the back of the car and so were able to see more of what happened usually "behind the scenes". Mathew and I drove off together until he said he didn't actually feel quite ready to leave, so we returned and the four of us gathered in front of the building for a while as the cremation began. William's death has been profoundly shocking. There are many things I have thought about during this week that I'd like to write about, but not quite yet. Shifting the cows, calves and yearlings mob, from Flat 2 to Flat 4. 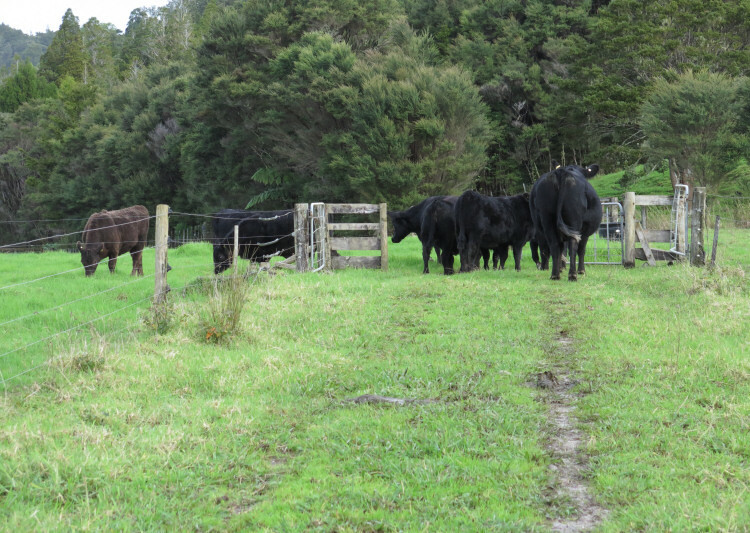 The animal at the back with the not-black tail switch is Gina 142, the first to calve last season, now 3½ years old. She has remained in excellent condition throughout the summer, while raising her lovely daughter. Calving my heifers at two is sensible in many cases, but keeping some of them an extra year before calving does also work really well, as long as they've not grown too fat in the mean time. The calf of a three-year-old first-time mother is usually much better (bigger, better fed) than those of the younger heifers and the young heifers themselves are often quite physically stressed by the process in a way their older sisters are not. Two-year-old calving is a more profitable approach because of the production of an extra calf in the life of a cow, but only if the heifers do well enough to get back in calf repeatedly after that first year and their health and longevity is not affected by the early start. Not everyone had moved. Eva stood in the middle of Flat 2 and watched everyone else leave. Typical. Just like her mother and sisters. I had to walk down and get her. We were back at Elizabeth's for dinner again this evening. It feels better to be with them all.